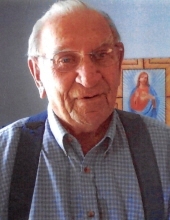 Stanley Lear was born June 11, 1920 in Jackson County and departed this life Wednesday, November 28, 2018 at his residence, being 98 years of age. He was the son of the late Dave & Lizzie (Cole) Lear. Stanley is survived by two sons, D.A. Lear and his wife Brenda and Glendon Lear and his wife Pat all of McKee. He was blessed with seven grandchildren, Michael (Lisa) Smith, Lisa (Steven) Truett, Annie (Jamie) Moore, Melissa (Doug) Simmons, Nikki Lear, Dave (Renea) Lear and Derek Lear and by eight great grandchildren, Caleb, Jaden, Adycin, Madison, Tyler, Stanley, Kylie & Jackson. Stanley was also survived by two special caregivers; Meda Tillary and Elrena Sparks. In addition to his parents, Stanley was also preceded in death by his wife, Jane (Taylor) Lear; by his daughter, Marcella Smith and by his siblings, Andrew Lear, Walter Lear, Fred Lear, Robbie Lear, Grace Cole, Lizzie Carpenter, Denni Carpenter, Ida Durham, Mary Gabbard and Letha Durham. Stanley was a member of the Blackwater Baptist Church #1 and was a veteran of the United States Army. "Email Address" would like to share the life celebration of Stanley Lear. Click on the "link" to go to share a favorite memory or leave a condolence message for the family.